SP fighter direction radar and TDY jammers had been installed by the end of the war. The Appalachians were completed in 1943 on Maritime Commission standard C2-S-B1 hulls. They filled a need discovered in the early amphibious assaults in the Pacific. The assault commanders and staff naturally gravitated to the most powerful warships in the force as their floating headquarters. However, the communications facilities were inadequate, these ships had other duties, and to make matters worse the radio systems tended to break down every time the ships fired their main guns. Turner chose a transport, McCawley, as his floating headquarters during the Guadalcanal campaign, and McCawley proved more successful in this role than a major warship. This resulted in a requirement for a specialized ship, loaded with communications gear, to serve as the floating headquarters for such assaults. The British had already discovered the need for a floating headquarters during the Dakar operation in 1940, and had commissioned Bulolo as a communications ship in June 1942. 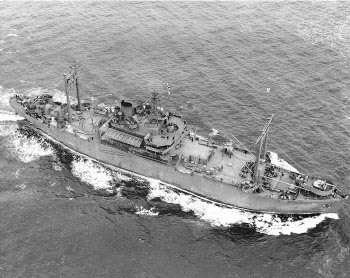 Their representatives in Washington asked on 28 July 1942 that three more such ships be converted, and early reports from Guadalcanal and favorable impressions of Bulolo by visiting American brass led to a decision on 15 October 1942 to convert three C2 hulls to amphibious command ships. The ships were given an internal arrangement based around a joint operations room that provided a tactical plot; a war command room for the senior officers leading the assault; and a flag plot. There was also a CIC for fighter control and a voice filter room for processing voice transmissions. An intelligence office and a photoreconnaissance interpretation room provided up to date intelligence, and a map reproduction room turned out documents for briefing officers leading the assault. These spaces proved sweltering in tropical weather, and air conditioning was added to some spaces by November 1944, but the ships were never really adequately ventilated. The ships had the most complete radio communications facilities of any afloat when completed, which included monitoring receivers for enemy transmissions. There were also extensive radar, air navigation beacon, and jammer electronics suites. There was significant problems with antenna interference that required careful antenna redesign and relocation.